-Movies on my Mind-: Is Music Piracy to Blame for so much Crap in the Charts? Is Music Piracy to Blame for so much Crap in the Charts? The older we get, the quicker time passes. It’s been fifteen years since Napster, the file sharing service that enabled anyone with an internet connection to transfer songs at the click of a mouse, revolutionised the ways in which we acquire music, blurring our understanding of ethicality and entitlement. For anyone that was a music-loving teenager during this time, Napster became the reason why you pestered your parents for broadband connection. It became a hot topic among youth communities; kids e-mailing links to their friends informing them of the biggest phenomena in music ownership since compact discs, only Napster was much cooler because it had every available song and was giving it away for free. Napster changed the world and its legacy continues to contaminate society’s interpretation about the value of music. Actor Alex Winter (the bloke that played either Bill or Ted in their Excellent Adventure) has made a documentary about the very moment Napster became the darling of youngsters everywhere, and, in turn, courted the ire of signed artists wanting to make a living from music. Napster was a program developed and launched by a team of teenagers who tapped into shared beliefs that consumers had been inured into accepting a very unfair deal perpetrated by the music industry. Britain during the period Napster hit was a country where the cost of purchasing records was ridiculously high. The news channels would often run features on how consumers were being ripped off, reporting that the price of records was comparatively cheaper in America and mainland Europe. British teenagers, the biggest conventional market for music at that time, would often express its chagrin of being exploited by a music industry that had no value for its customers, jacking-up the prices of back catalogue records to ludicrously high levels. The British Phonographic Industry, which is essentially the trade association of major record labels in the UK, had introduced new regulations at this time that limited the number of tracks available on chart singles, meaning consumers would often have to purchase multiple copies in order to possess all relevant B-sides. The British music industry had completely browbeaten the very people keeping them in business. Even before Napster landed, the boardrooms of British record labels were mooting possibilities of electronic file sharing changing the way in which its customers accessed music. The mid-90s was the last period in which British music actually had a proper sense of identity, with Cool Britannia and Britpop gripping every part of our indigenous popular culture. Still, there is no denying that this period in British pop music was when things began to get mundane in terms of quality. Britpop was a markedly Caucasian and predominantly middle-class cultural movement, which meant it was extremely popular and profitable for all that wanted to tap into it. Bands were coming and scoring by making chimneysweep sing-alongs, with record labels thinking the gravy train they had boarded would never stop chugging at cocaine speed. Yet there were voices of concern that sensed the prominence of emerging new technologies may have the power to alter conventional business models. A person that worked at the London offices of Sony Music Entertainment circa 1997 recalls a meeting in which, allegedly, the topic of internet music piracy was discussed. Executives in attendance were hugely complacent; thinking established consumer models were too ingrained to be broken. The music industry suspected a threatening change coming but was too arrogant to care. Cool Britannia and Britpop are over now, though Napster remains. Napster was taken over by a private media group that whitewashed its tarnished image but has failed to compete with less mottled competitors. What definitely remains in terms of Napster’s legacy is the notion that music is something we are entitled to, something that we needn’t pay to possess. In another five years an entire generation will have passed since Napster’s inception, meaning the music industry has largely failed at convincing adolescents that one must acquire music by paying for it. The music industry has worked seriously hard in rectifying its early complacency and there are now several methods in which to legally procure music, but it has all come too late. 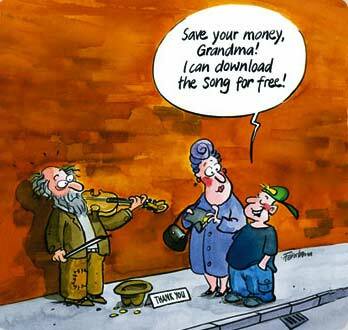 Had the notion of paying for music electronically arrived before consumers realised they can get it for free then that may have changed everything because most of us would’ve remembered an earlier incarnation when music exchanged over the internet required the transfer of money. It may have been easier to return to that principal; for it to have been the incipient core of electronic music sales. The music industry didn’t do that and most of us remember Napster as the original model of internet music exchange: a transfer that didn’t require any involvement of funds. The US is in a bad way, too. The Nielsen SoundScan monitors music sales in America and tells us that despite the panoply of available legal methods for acquiring music, consumers continue to purchase fewer records. Merely 5% of American downloaded music is purchased legally. As a result the music industry has retracted to its safe mode in which insipid pop is considered the only realistic way to generate profits, yet it’s still not working too well. It’s pretty much impossible to think that a leftfield band like Nirvana could sell 30 million copies of Nevermind in this age. Things don’t work like that anymore. Admittedly, the music landscape is entirely different now, more protean than ever, evolving in ways none of us can adequately predict. Whereas a band like the Smashing Pumpkins would have released a hit record that sold 2 million copies in its first week of release in 1998, they now only shift something like 20,000 units. Sure, inevitably a band’s popularity and relevance diminishes with time, but our ability to listen to music has altered significantly, with most of us legally streaming music via bonafide free services. Good music is omnipresent as ever, but making money from it is less certain. Gone are the days of million dollar music videos directed by acclaimed directors and instead musicians rely on people uploading underscored viral clips onto Youtube that are often played for laughs. Nothing makes sense anymore. Music truly does belong to the people, but the historic era of unaccountable rock ‘n’ roll excess that enabled Mötley Crüe to become decadent billionaires and document their shocking antics in books and films is over. Music icons will never become lingering rock gods the way they were when Jim Morrison, Keith Moon, Eazy-E or Kurt Cobain made their mark. Rock ‘n’ roll, as some of us remember it, seems over. I remember Napster. It kinda sucked. Or maybe it was my AOL dial up that was getting in the way of things. My free songs would take up to 3 hours to download sometimes. And if I tried to download more than one at the same time...well, it could take days. I remember when cd's went from 12.99 to 18.99 in what seemed to be overnight. In 1998, that was a ton of money to a 12 yr old who didn't have an allowance. Rock n' Roll does seem to be dead. Long gone are the rock gods. But it seems (from a trip to Jim Morrison's grave in Paris) that they are most certainly not forgotten. Lady Gaga too seems to be dead. Which...I know isn't rock and roll, but damn that was fast. I remember hearing the cries of musicians complaining about lost profits and not feeling any sympathy because at that time they were so rich. But today I have friends who were once successful musicians and are now trying to still make some sort of living through music. It's nearly impossible to make much money through recorded music, so live performances are just about all they have left, and that doesn't pay as well as you'd think. Most iconic artists looking back are now saying if they'd had to make it in the music business today they don't know how they'd do it. Many are having issues with the labels they recorded through going under, leaving no legal team to defend their copyrights. Thus, their income from their old songs is suddenly just gone. It's a surprisingly real crisis. I never thought musicians were ripping people off since there are so many other people involved in making the music and putting it out in stores. Also, I don't begrudge other people's success. I can see how music and musicians are hurting these days. I miss the rock gods.